The LAB-X2 Experimenter Board combines the convenience of the LAB-X1 with the simplicity and flexibility of the PICProto boards. Many different projects may be created using the LAB-X3. Some examples include LCD clock, servo controller, LCD backpack, and many more. The new LAB-X3 is microEngineering Labs, Inc.'s newest experimenter's platform. 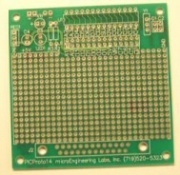 It provides a full complement of hardware peripherals for an 18-pin microcontroller such as the PIC16F84 or PIC16F628. For the 28-pin PIC® 14C000. 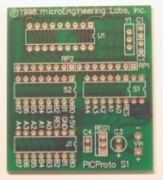 For the 14-pin PIC® 16C505, 16F630, 16F676 and the 8-pin PIC® 12C508(A), 12C509(A), 12C671, 12C672, PIC® 12CE518, 12CE519, 12CE673, 12CE674, 12F629, 12F675 microcontrollers. For working with the circuits in "Easy PIC®'n" and "PIC®'n Up the Pace". 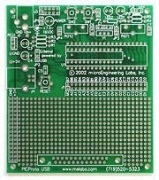 Holds 18-pin MCU, oscillator, 5-volt power supply, DIP switches and socket to solderless breadboard. 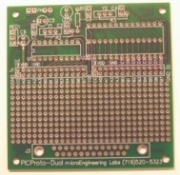 Compatible with 28 and 40-pin devices, this board accepts additional USB circuitry and connector for use with the USB-equipped PIC® 16C745 and 16C765.